Accor Hotels expands ibis family hotel network through franchise. 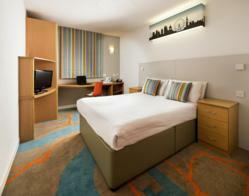 ibis Styles London Excel has opened its doors following an exciting refurbishment of bedrooms and public spaces. The hotel, ideally located opposite the London ExCeL Conference Centre in the Docklands area of London, is within one mile of London City Airport and within easy reach of The o2 Arena and the Olympic Park. It offers 302 bedrooms each featuring a work desk, flat screen TV, tea & coffee making facilities and a shower room. The hotel boasts four separate dining spaces and The Capstan Conference Centre with four meeting spaces for up to 150 people. Unique to the economy segment, the ibis Styles hotels (formally all seasons) are all individually designed, contemporary hotels. They offer a new economy hotel experience and provide a high-quality, budget boutique atmosphere for all visitors. ibis Styles London Excel is the fourth ibis Styles hotel in the UK, all of which are located in Greater London. The ibis Styles network will continue to grow across the UK in 2013. For more information on London hotels please visit our website.